I will show you 'Sado', Japanese tea ceremony. according to the traditional manner. the fine arts which decorate the tea house, etc. Tea originally came from China in Heian era (8th century) by Japanese mission to China. It was ball-shaped half fermented tea and used only as medicine. In Kamakura era (12-14th century), green powdered tea was brought to Japan by Zen Buddhism monks (Eisai, Dogen, etc). It was also introduced as medicine. But different from 8th century, it was used for spiritual exercise along with the spread of Zen Buddhism, After tea cultivation became popular, the custom of drinking tea prevailed among the common people. In Muromachi era (14-16th century), Chinese tea utensils were loved and to have grand tea ceremony using these utensils became popular amoung feudal lords. Juko Murata explained the ideal tea cremony which emphasizes the spiritual communication between host and guest. It became the origin of 'wabi (state of calm) cha'. The emvironment of tea ceremony also became important and new style of architecture such as 'shoindukuri' and 'tokonoma' was developped. In Azuchi-momoyama era (16th century), 'wabicha' was perfected by Jouo Takeno and his disciple Senno-Rikyu. Simple tea house like in the back-country became popular. In the tea house, the status was denied and everyone was considered equal. Wabicha by Rikyu prevailed among samurai warriors. Some feudal lords such as Enshu Kobori and Yuraku Oda started the tea schools. Until the begining of Edo era (17-19the century), tea ceremony was only performed by feudal lords and rich merchants, but in mid Edo era, it rapidly spreaded to townspeople who became wealthy. Major tea schools, Three Sen families (Omote Senke, Ura senke and Mushanokoji Senke) who were originally townspeople welcomed these new comers. Then 'Iemoto system' the system of head master of the school was established to organise the many disciples. Also the way of training was created and tea ceremony was widely spreaded to all over Japan as enrichment lesson by village officers and merchants. By popularization of tea ceremony, it had changed as leisure, but on the other hand, the original purpose 'the beauty of the mind when welcoming guest' was emphasized. The basic idea of Rikyu's tea ceremony 'hamony, respect, purity and immovable heart' was created in this process and tea ceremony of nowadays was perfected by reconsidering the procedure and the original spirit to welcome people. In late Edo era, townspeople started 'Senchado' (casual tea ceremony) by the reaction against the stiff and formal tea ceremony. In Meiji era (late 19th -early 20th century), feudal system collapsed and the tea schools protected by the feudal government got into financial difficulties. But by the effort of reconstruction by Urasenke supported by financial leaders, tea ceremony was set in the liberal art education for ladies. Since then, the tea ceremony has obtained the characteristics as lady's education, and we can see nowadays the tea ceremony by the ladies with beautiful kimono. In 20th century, tea ceremony has spreaded to overseas. Tenshin Okakura who worked for Boston Museum published 'THE BOOK OF TEA' in 1906 and tea ceremony attracted intellectual western people and the work 'Tea Ceremony' became common. Senno-Rikyu explained 4 basic ideas and 7 procedures. 1. Peaceful mind and harmony with the guests and tea utensils. 2. Respect others and abstain. 3. Purify your mind and body. 4. Keep your mind immovable and at ease. 1. Whip tea like a proper dress. 2. Put the charcoal to make boiled water. 3. Make warm in winter and make cool in summer. 4. Arrange the flower like it blooms in the field. 6. Prepare umbrella even on sunny day. 7. Concentrate to welcome guest. Official tea ceremony has a lot of manners and procedures starting from former days. There are 7 kinds of ceremony by the time it is taken place. 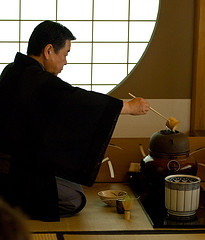 For example, simple Kaiseki food is prepared before serving tea for Noon ceremony. But for the experience program, usually only 'Temae' (serving tea) is performed. Following is the procedure from the view point of the host. - Bring the tea utensils to the ceremony place. - Clean the utensils and tea cups in front of the guests. - Warm the cup wih the boiled water. - Put the powdered tea in the cup, pour the boiled water and stir with bamboo whisk. - Serve the tea to the guest. - Clean the utensils and bring away.